The world’s first terapixel macro image is a big claim. This is going to be BIG! Just how big is that though? Well, a terapixel is 1,000,000,000,000 pixels, or 1012, or a million megapixels, or a thousand gigapixels. And no one has ever made a terapixel macro image before, so this will be a genuine world first. We have seen all the claims of terapixel images, some of which could be debated; rather than have that debate, we decided to make a terapixel macro image which had never been done. To get some idea of size, take a look at the image on the right. 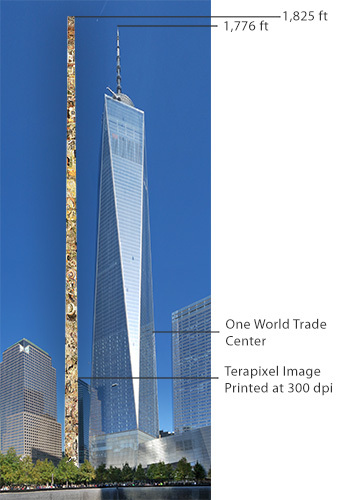 If we printed the Terabite image (at high resolution, which shrinks the print size) it would be higher than One World Trade Center! Why Food as the Subject? Many reasons! Attendees at the SIGGraph conference in Vancouver were invited to create an intricate collaborative mosaic of their choosing. Food was a good choice since it provided different textures, colors, sizes, and could be easily placed. We went out and found local food items and materials and then let the artists go to work. Over 100 attendees worked on the mosaic for 5 days. We also wanted to use materials that everyone is familiar with in terms of scale and size. Food, like many other objects, when viewed at high magnification takes on an abstract form and it’s often impossible to work out what it is you are seeing. 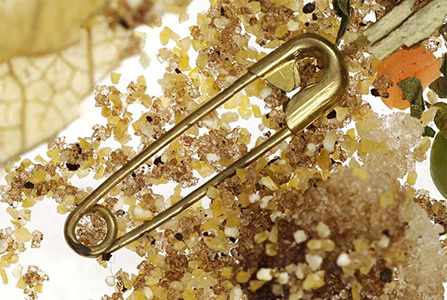 Thanks to Naomi Cooper, there are over 60 non-food items that are in the image. Why are they there? Well, first of all, fun! This whole project was intended to be a learning exercise, and to stretch photographic and imaging tools and techniques. We also have some ideas for a fun competition involving them in the future. To be sure you know when we announce that, sign up for our newsletter below. We love a challenge! In concept, it should be easy to make an image of this scale. Take a bunch of images, merge them together, and voila, you have your image. But when you get into the details, you run across a number of hurdles that would only be encountered when you tried to actually make the image – where theory and real-world diverge, as it were! So this is our way of identifying those issues and working out how to overcome them. This was an opportunity to develop and expand our knowledge and expertise with a stretch goal, and we did. In short, we learned by doing – and in this project we learned a lot. Automation is critical in both in capturing and processing over 600,000 photographs. We shot the photographs using three GIGAmacro Magnify2 robotic imaging systems connected together. Each of the three systems shot photographs at a rate of 3,000 frames per hour and ran almost continuously for 4 days. In post-processing, we used in-house tools to streamline the process and file management with off the shelf focal stacking, image stitching, and rendering software. When capturing a subject at the macro and microscopic level, depth of field (the plane that is in sharp focus) is very shallow. In this case, only 1mm was in focus in the original photographs. We increased the sharp area to 5mm by using a technique called focus stacking. For each area that we captured, 6 images were taken at different focal positions, then combined in post-process to provide an image with a higher depth of field. Where did the lost 1mm go? That is lost when we overlap each photograph to ensure that it is sharp all the way through. It was important to ensure that the subject is continuous and didn’t have large “blank” areas. To accomplish this, we created a panel system upon which to build the food mosaic. The panels were prepared ‘off-line’ by volunteers and then fed into the system, each panel in turn. Each 2 ft x 1.5 ft panel was connected to the previous panel before it was captured. In total 63 panels of mosaics were produced and photographed. To reveal more detail in the food mosaic, we used both direct flash lighting (from above) and backlighting (from below). Flashes have an extremely short duration (1/1000 of a second) which eliminate any motion blur. The Canon MT 24EX flashes were used in conjunction with the GIGAmacro built backlight flash for lighting from underneath the subject. Both are synchronized to fire at the same time. Very few file formats exist for handling images of this magnitude. Formats that we know can handle file sizes this large are KRO, RAW, and BIGTIFF. 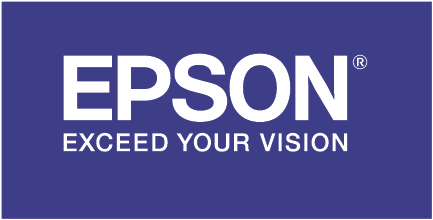 Files under 300,000 x 300,000 pixels can be handled by Photoshop Large Format (PSB). While we used many different formats in the post-processing steps, our final image is stored as a BIGTIFF image. So how do you view an image that is this large? You use a tiled image viewer such as GIGAmacro Viewer. You use similar technology every time you use Google Maps. It works by only loading the part of the overall image you are looking at at the time. The entire image is stored as over 5 million individual tiles (jpeg files) that are each 512 x 512 pixels. The GIGAmacro Viewer determines which images to show as you pan and zoom throughout the image. 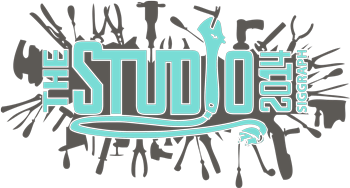 Four Chambers Studio (GIGAmacro’s parent company) has been involved with SIGGraph, in the advanced technology area known as the Studio, for almost 20 years. When we decided that SIGGraph would be the venue, we imposed a huge time constraint. We had to capture all the photographs needed – over 629,000 – in less than four days. The only way to make that work was to construct a special rig. We used three standard Magnify2 systems and linked them together so that the mosaic panels passed under all three rigs. Each rig had a view of, and photographed, one 24″ x 16″ panel. So we shot three panels at a time. The design of the ‘big’ rig was such that the gap between each of the three systems was 16″, so after all rigs had finished photographing the panel, we simply slid the whole mosaic ‘forward’ and a new panel slid into place below each machine to start over again. The preparation, feeding and sliding was completely manual, so every three hours or so, one of the team had to be on-site to do the sliding. Once again the benefits of teamwork came to the fore. Gene is more of a night person, and Graham is a very early morning person. So with suitable planning and scheduling, we ran almost 24 hours per day. Creating the final image was more focused on the technical challenges, but the subject needed to be interesting too. So we thought we’d have some fun playing with food. We setup a process where attendees at the SIGGraph conference would create a mosaic design of their own and incorporate that as part of the bigger project – using only locally available food as the material. The attendees could only see the section they worked on plus a little of the last person’s mosaic – much like the practice of drawing an “exquisite corpse“. There were some fun logistical as well as technical challenges – the conference organizers were unsure how to deal with us. We weren’t selling food – that was banned. We weren’t eating food – that too was banned. Yet we had to get them to agree to let us bring in and work with a lot of food. In the end Gene’s persuasive common sense approach prevailed! From capturing the photographs – about 637,000 of them – to post processing, to creating the final image, there are hundreds of steps, large and small, to get what you see today. Post processing in particular involved a great deal of planning and new tools to handle the quantity of photographs and size of the imagery. Just as a hint of the scope of the challenge, the final Terabite image is 2.8 terabyte file – or about three times the size of a typical hard drive in your computer! Read more about the entire post process in our article about “Chewing on the Terabite Image“. Sponsors & Support: Thank you! Without the help of these sponsors we would have not been able to tackle project of this scope. Our gratitude and thanks to each and every one. From each of these corporate sponsors are people who went out of their way to help gain their organization’s support, rooted for us and made things happen when we needed them to happen. They will be able to say forever that they were key to, and part of, the World’s First Terapixel Macro Image.